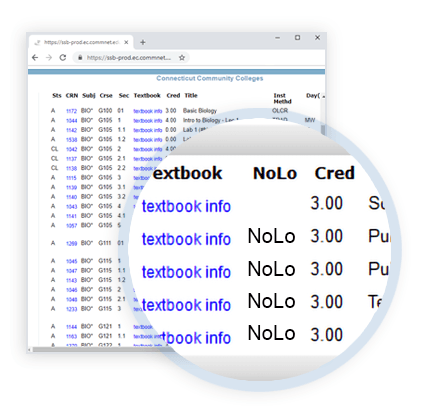 Courses marked as "NoLo" contain text-based materials that are no cost or low cost, and will not exceed $40. Check course descriptions for the "NoLo" tag to take advantage. NoLo = Total Course Materials <= $40. College and course participation may vary. Included in the cost caps are textbooks and other text-based materials, workbooks, online homework platforms, and codes or publisher-provided curricular materials for students. Excluded from the cost caps are equipment (such as art supplies, calculators, or physical lab materials as well as lab manuals) and fees for test proctoring. 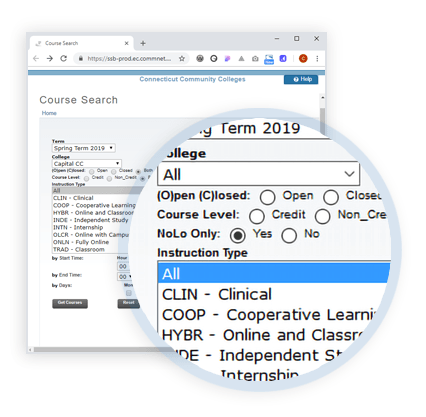 Under "Advanced Course Search", select "yes" for "No Cost/Low Cost Course Materials"
Open educational resources (OER) are free and openly licensed educational materials that can be used for teaching, learning, research, and other purposes. OERs offer numerous benefits for faculty and students. Course materials that are No cost or Low cost. To qualify, the total cost must not exceed $40. A network among CSCU libraries, supporting faculty in locating and adopting more affordable, quality educational content for their students. On March 1, 2019, the CSCU OER Advisory Council hosted the CSCU OER Summit, a split day event for faculty and student government leaders to learn about the benefits of OER, the basics of Copyright & Creative Commons licensing, and the concepts of Open Pedagogy.